so i have been thinking..
i get asked all the time, which my favorite shoes are. though it´s difficult and unfair (LOL) to my other pairs, the answer has got to be these CANDIES. i just automatically cheer up when i wear these. when this pretty little mint dress (mint is the new black!) came yesterday, there was no doubt that these bonbon colored shoesies perfectly go with it! i even went tights- less for one second (thus only four photos!) for you guys! i def. need an emergency pair in case these get ruined (knock on wood). I must say I was so jealous whe I first saw you with these booties! I am so in love with them :p. But are they good quality? I heard they weren't really good... That mint dress is soooo beautiful too, but I would wear it in summer not in December :p.
I can imagine that you can't feel sad wearing them! first time I noticed your blog was less than a year on hypeed.com participating in Andy's competition.. your look was amongst best entries...And you were wearing those platforms....you looked amazing at that time, you look amazing at this time...!! Love that mint dress and the color of that jacket is gorgeous!!! OMG, those booties are totally cool!! WOW, das nenn ich mal ein Hingucker! wow die schuhe sind einzigartig und wunderschön!! sie passen auch perfekt zum outfit.. gefällt mir sehr sehr gut!! 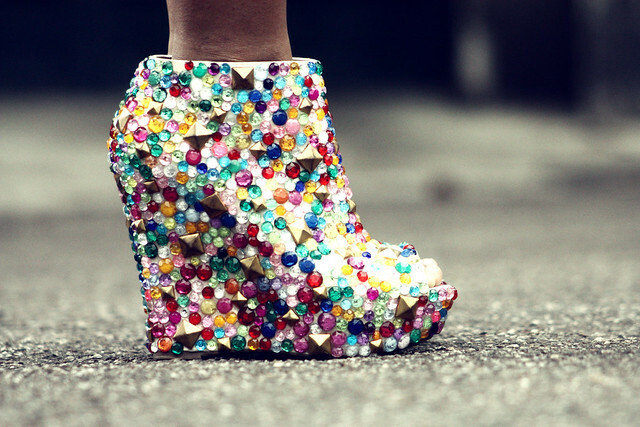 Those shoes are amazing!! I would even bought them to decorate my house! You have such amazing style!! Love it !!!! Those shoes are insane! Love them. and they are great in a neutral look! Du hast immer die besten Schuhe! your violet kacket is simply perfect! Wooow!!! i love!!! very sweet shoes!!! The shoes are incredible! Very, very jealous!! Me too, love the unique design! These boots are definitely outstanding! Love the way you match them! Everytime I see those shoes, I fall in love once again. This article is very good, and I also really like sequined uggs very much.